Today we headed from Córdoba back to Puente Genil, which will be our home base for the next few days. On the way, we visited the La Estepeña chocolate factory. The chocolate factory was absolutely amazing. The chocolate city of Rome had intricate details to emulate the architecture in the real city. The people who created it not only captured the uniqueness of the city, but the uniqueness of the time period(s). On one side we saw soldiers on horses and old buildings. As we continued looking across the chocolate city, there were elaborate miniatures of modern bridges and people: even Pope Francis was depicted giving a speech! When we went in the factory where there different candies are made and packaged, it was interesting to see the preparation process, but it also felt weird to watch people work. Being on an elevated walkway and watching people work in a factory seemed to separate us into two groups, classified by social identifiers. There were also gender divisions that played a prominent role in factory life. Most of the workers were women, and there were different uniforms or dress codes for women and men. It was an interesting experience to observe and reflect on. 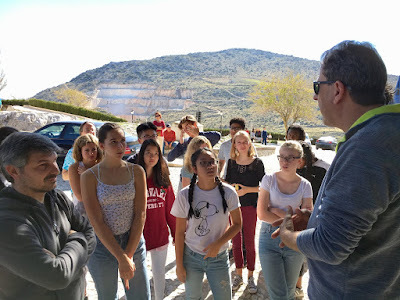 After leaving La Estepeña in a state of sugary bliss, we drove up the mountain road to Castillo de Estepa, where we had some time to walk around and take in the sights. The Castillo is the highest point in town and is the site for a church, a functioning convent, and an ancient Arab fortress tower. Stone walls and walkways, beautiful views of the hilly landscape, and lots of fragrant lavender made this a lovely place to take a breath...and some photos. A short drive brought us back to Puente Genil, where we had lunch and then a rare couple of hours of downtime in which to rest, read, write, or spend time with friends. In the evening, Javier taught a lesson on travel photography. 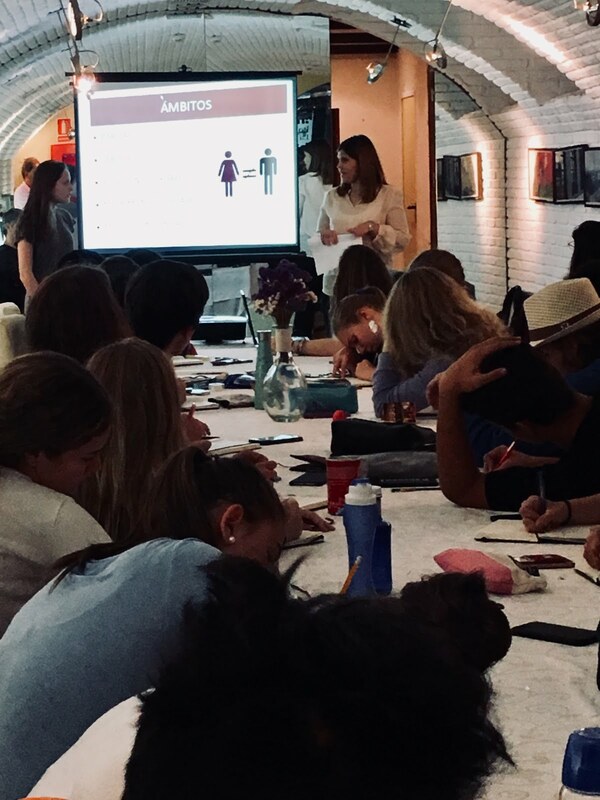 We then heard a presentation on gender rights, domestic violence, and immigration in Spain. Over dinner, we did some talking and writing about boundaries––both literal and figurative––and boundary crossing. Boundary crossing can mean a variety of things, and throughout this trip, different kinds of boundary crossing have happened. It can be when someone steps out of their comfort zone, where they are forced to do it or choose to. Or it can be when, for example, my female classmates have been "cat-called" by random men on the streets of Morocco. These men were crossing boundaries and were doing things that made people uncomfortable. Also, minority students, including me, have been getting many racial comments said against us, which has made us not only uncomfortable but furious. We crossed a literal boundary from Morocco to Spain. When crossing the border I thought about how lucky I was to be able to easily makes this journey. We learned in Morocco that some people really want to migrate to Spain in hopes of a better life. In many cases, they are unable to immigrate legally, and risk (and often lose) their lives trying to get smuggled across. So, in crossing that boundary, I was appreciative of my privilege. Today I also pushed some emotional boundaries. There was a presenter who spoke about inequality between womena nd men and also about immigration, and I translated what she said to the group. On this trip I had really wanted to have a chance to translate, but when I stood up in front of my classmates and teachers I was really scared. For me, whenever I have to speak in front of a group it is really difficult for me and I get very nervous. In the end, I was very happy that I was able to translate for our group. There was one time when I did not know a word she said and I has to ask and I felt dumb. I was able, though, not to get too upset and just continue. I really pushed my boundaries by translating in front of the group, but I am glad I was able to do it because I am proud of myself. Tomorrow we will have an exchange with students at a local high school and, in the evening, the long-awaited flamenco lesson! Crossing boundaries: loved the reflections. Way to go, Lizzie as your served as interpreter. Nice to hear that you found some chocolate and R&R in the middle of it all. Have fun sharing your song, dance and poetry with fellow students tomorrow!